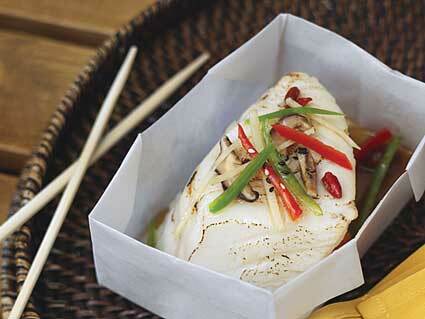 Place the seabass in a preassembled parchment paper box. Place the peppers, mushrooms, ginger, longan, wolfberries, and pepper directly on top of the seabass in that order. Pour the origami sauce directly on top of the fish then drizzle the sesame oil around the fish. Put the top of the parchment box back on and microwave the seabass on high for 4 minutes. Or cook in the oven for 12-15 minutes at 325°F. Combine all of the above ingredients and blend thoroughly.